Marine Filler. 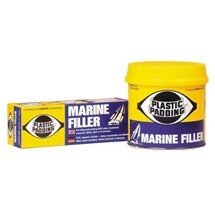 Specially formulated for marine applications Suitable for use on wood, steel, GRP, aluminium. Hardens in 10 minutes and can be painted with all marine paints. Large tin 560ml. Easy to apply, shape and sand, able to set in 12 minutes.